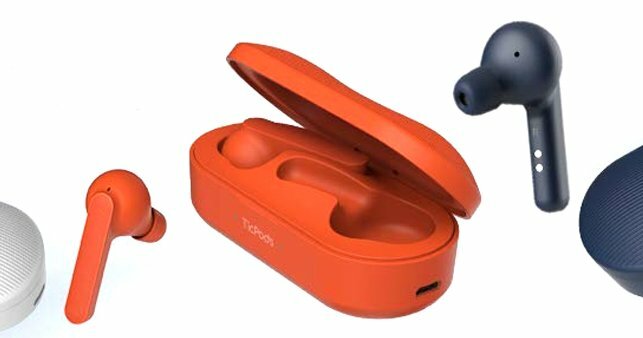 Chinese wearable newcomer “Mobvoi TicPods Free” recently brought his cheeky pair of wireless headphones to the market. Since the AirPods appeared two years ago, wireless earbuds have been considered the ultimate solution for mobile music enjoyment without cables. With two wireless units and built-in batteries that connects to your smartphone or other Bluetooth audio sources via Bluetooth, these small in-ear headphones are not only incredibly practical but also elegant. TicPods Free comes with a high-quality charging box and can be selected in three well-chosen shades like Navy, Lava, and Ice. It has a silicone loop what attaches the smart charging and transport box, it also includes a small USB Y-cable with charging ports for micro-USB and USB-C, and an alternative set of smaller ear gums. The ergonomic fit of the TicPods is comfortable to wear and ensures a good grip. However, it depends on the individual anatomy. Mobvoi only delivers the ear gums in two sizes. If you open the magnetically closed charging box, you can see two front LEDs that reflects the charging status and the TicPods can be connected to the smartphone anytime via Bluetooth. When the earbuds are placed in the ear, it recognizes automatically via their in-ear detection and sends signals to your iOS or Android smartphone their current status. When you set your TicPods aside, running media plays are virtually started or paused. TicPods has an appealing and balanced sound. The TicPods comes with a strong battery power that serves sounds endlessly for several hours. Controlling quickly over simple touch commands will let you feel comfortable and free. Phone calls are also possible via the integrated microphones and can be used with Google Assistant at any time as well. Putting the earbuds back in their charging box will turn them off automatically. These earbuds are an all-around and smart user experience rich device.